Wind, rain, squash, and Dixie! The wind hits the Best Little Trailer broadside. I don’t consider changing position because the other choice around here is soft ground prone to turn into mud. I don’t mind a little rockin’ and rollin.’ I did take down the Wilson antenna. There’s a possibility we might experience an electrical storm. The last time lightning threatened, I stowed the antenna under the BLT. I don’t like doing that. I imagine hungry rodents eating the vinyl off the coax cable like it’s corn on the cob. This time I put the antenna in the Perfect Tow Vehicle. It isn’t needed here anyway because signal towers are on hills to the northwest and to the south and give five steady bars. What to do on a rainy, cold, and windy day? Cook and eat, of course! At the last grocery trip I zero in on the zucchini, but I see it’s $1.99 a pound. Lookee over here . . . This Mexican squash is $0.99 a pound. I wonder what Mexican squash is like. Well, I’ve never met a squash I didn’t like, so I’m going to try it! Today I slice up a Vidalia onion, throw it in a pan with some oil, and right as it’s beginning to carmelize I add the sliced squash and diced red peppers. I cook that with the lid on until soft, a bit al dente, and . . . Hmm, what else can I add? I know! Frozen peas! The end result is pretty good. In fact, Bridget and Spike discover that they like Mexican squash, too! Okay, that’s enough food news. Now what the heck am I going to write about? It’s funny how many times I’ve wondered that, and then stuff happens. As I’m writing the above lines, I hear a woman’s voice. Dixie is one of my blog readers, just like you. You may remember reading her comments here. Dixie is recently retired, and she and her husband are visiting family in Prescott Valley. On a lark she drives over this way, wondering if she can find me. About to give up, she spots Rusty’s camper beyond the trees. No way am I going to invite anyone into the BLT. It’s smelling of fried onions and overflowing with dirty dishes and pans! Dixie and I have a wonderful visit outside. Dixie exudes enthusiasm and good cheer. She’s very excited to meet me and the crew, something that always amazes me. Bridget and Spike are excited, too, at meeting someone new. Rusty hears the commotion and comes out to join us. Dixie, like many of my present readers, discovered this blog when the Rusty and Timber story was reported in the news. The three of us chat a bit, Dixie meets Timber, and then cold rain begins to fall and we say a hasty goodbye. What a friendly lady! The crew and I dash through the rain for the warmth of the BLT. I dry off their muddy paws and with a few swipes I wipe the prints off the vinyl floor. It’s times like these that I’m reminded of the benefits of a tiny home. 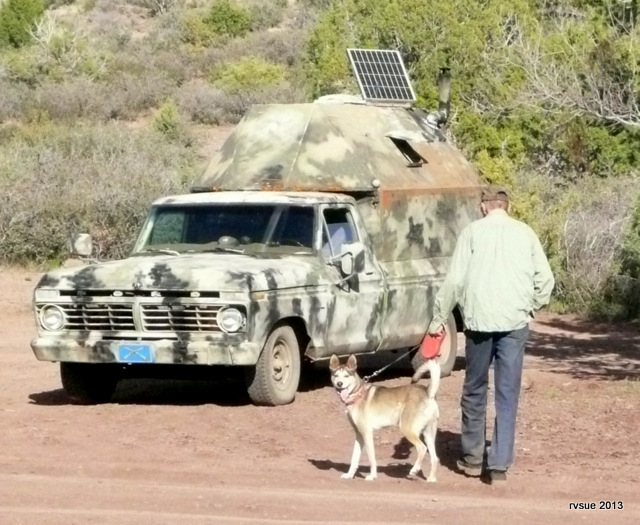 This entry was posted in Simple living and tagged Arizona, boondocking, cooking, dogs, recipe, RVing, simple living, squash, Wilson antenna. Bookmark the permalink. 73 Responses to Wind, rain, squash, and Dixie! Hmm… maybe it’s the name. The Dixie I met here is sweet as a peach, too! My bird feeder was swinging around the tree branch. I have had wind and dust storm all afternoon. Oh well, at least I made it to Rockhound and got set up before it started. Got to enjoy my coffee and finish my book before it started…….lol. Hope you get to enjoy Rockhound, Pat. I too love when you describe what you are cooking…and the pictures make the whole cooking experience come together….very nicely! Dixie you lucky lady…you not only met RVSue and the crew but Rusty and Timber! That’s a two-fer! Rusty’s camper blends in so well, I’m surprised she saw that before the BLT. As for us…spring is here! It’s 50 degrees, 8 ft snowbanks are slowly melting…and the Canadian geese are flying in. Them darn snowbanks…who knew one had to shovel the snow into a bank and then shovel them out so they can melt? Isn’t that double duty? No need for a gym membership here in the NorthEast. I don’t envy you the snow shoveling. This morning (the morning after the above post) we’re dealing with mud. The PTV-BLT isn’t easily seen from the road. We’re in a slightly lower spot. I have to make comments short… overcast skies and laptop charge is low! Sounds great Rusty-keep enjoying! God’s blessings on u, Timber, Sue, Spikey and of course the Bridge! The same to you, Judie! It’s definitely windy at my mom’s place near Wickenburg but no rain so far. The sky sure looks eerie what with the dust blowing around all over the place. The sky has a dusky yellow cast to it and you know the sun is hiding behind all that dust but ya just can’t see it. It’s definitely staying indoors weather. Hope you don’t get sea sick with all that rocking although it might be better termed “camper sick” though I don’t know if there is such a thing and I now think I’m rambling…lol. I saw that “dusky yellow cast” while camped at Ogilby Road, Yuma, near Imperial Dunes. Can’t be good for the lungs! I don’t mind rambling… I do it all the time. Winds are really blowing here (east side of LA, CA) but no rain. We could surely use some rain. My post about snakes gave widespread creeps . . . The fact remains in all my time in the desert I haven’t seen a rattlesnake of any kind. Hope you get the rain you need! I’m not much of a cook, so your comment is encouraging. Lentil stew sounds good on a damp, windy day. Mmm. Looks good. I love veggies! So does my dog, Bucky! Raw carrot slices are his favorite treat and he even likes cucumbers. The crew has the advantage… In this small space I can’t get away from their pleading eyes, so they get a taste of what I’m eating. Bucky… how cute. More proof that dogs aren’t wolves and living with humans for all these centuries, they have become omnivores… just like us. Mugsy loves veggies. I make her food and add a can of peas and a can of carrots to the mix. (along with a pound of ground meat, a couple cups of cooked rice, and a mix from the Honest Kitchen). For those of you with dogs who have health issues… check out their website. Quick answer due to cloudy skies and low charge . . . I use both methods. I can’t say which is “better.” I usually go to the benchmark maps first, then get details online. come to think of it I used to do a lot more cooking in AZ. than I ever did in lot other states..
well maybe not including the Oregon coast, I also loved everything I cooked, It was just like I was eating in a top shelf bistro,,, ha ha,,,, Safe Travel’s Sue. When you’re own cooking is good, it’s the best there is! We’ve had wind all day but only a little rain. It’s all over now here in Surprise AZ. Now, a little cleanup and back to business as usual. Just got a note from a friend in South Dakota and they are getting snow AGAIN tonight….Arizona is wonderful….. I agree, Jim. Arizona is great! The wind is finally slowing down some, kasper and I eat veg every night, carrots are his favorite, Kasper is an african grey parrot his been on the road with me since his been 5 1/2 weeks old, he makes the pretiest bird sounds from going to diffrent places some of these birds just hang around and they seem to have lots to talk about. I wished it rained some here to wash off all the dust. That reminds me its time to make dinner for Kasper. Hapoy trails Sue. I once had a friend who had birds for pets. Somehow we lost touch over the years. “Bird people” are sensitive and loving. Regards to Kasper . . . and best wishes to you, Iris. I went grocery shopping and bought the ingredients you posted the other day with potatoes & green beans, now I’ll have to try the squash. Funny I never would have thought of the combinations you put together….I have no creativity in putting food together. We had a huge dust storm in the valley and now it’s sprinkling mud drops…yuk. Stay warm and comfy in your little home with Brig & Spike. Oh dear, I hope you love parsley because that’s the dominant flavor in that dish. Remember when I wondered if mud could fly… sounds like you’re seeing that. Have you thought about putting a lightening surge protector on your antenna to protect your unit while the antenna is up. We just got our cell phone power booster from Wilson and I can not wait to get it installed to use at Pinnacles this year..Hope we get to see you again this year. Hi Joe and Debbie! Great to hear from you again . . . I plan to return to Pinnacles, one of my favorite campgrounds with some fantastic campground hosts. I wonder if the antenna will work among those mountains. It would be wonderful not to have to drive all the way to Dubois to blog. Looking forward to summer and seeing you again . ..
A couple of days ago you mentioned that there was too much the ATV traffic in the desert and Rusty had the same complaint. Perhaps it was due to Spring Breaks at many of the school districts. So you may not need to move … I think this is the last week of breaks. Good point, Caroline. I didn’t think of that. Thanks for writing. Good dish u cooked, another one for me to try. I’m finding that I like veggies much better than meat and I used to be a meat-a-holic. lol Keep them coming. You know what tipped me over to not eating red meat? I read somewhere that red meat “putrifies” in the bowels. Yuck… that word got to me. That and feed lots and slaughterhouses… but I’m not going to get on my high horse here! Hi Sue – your dinner looks yummy. It was cold and windy yesterday in NH so i made a favorite – Savory Pumpkin Soup! Pumpkin soup, how very New England. Sounds delicious! What is the difference between Mexican squash and other squashes? Your dish looked so good!!!! 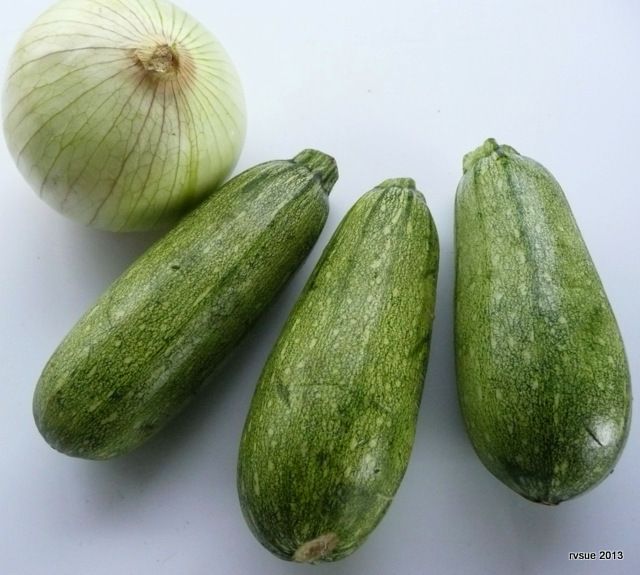 Mexican squash is very much like zucchini, only shaped rounder. The cashier said the Mexican squash doesn’t get mushy as fast as zucchini. I didn’t notice much difference at all. Yumm, I think a bit of pasta would be good with that dish ! Hope you stay dry and out of the rain. I had to turn on the heater last night for about an hour before we went to bed. The BLT was feeling damp and chilly. That’s all it took… well, plus, wearing sweatpants and socks to bed. We came through Flagstaff today–snowing and 32 degrees! Highway 40 E was closed. I don’t think you want to go there too soon. I appreciate the report on Flagstaff, Bev. You confirmed my reasoning not to go up there yet. 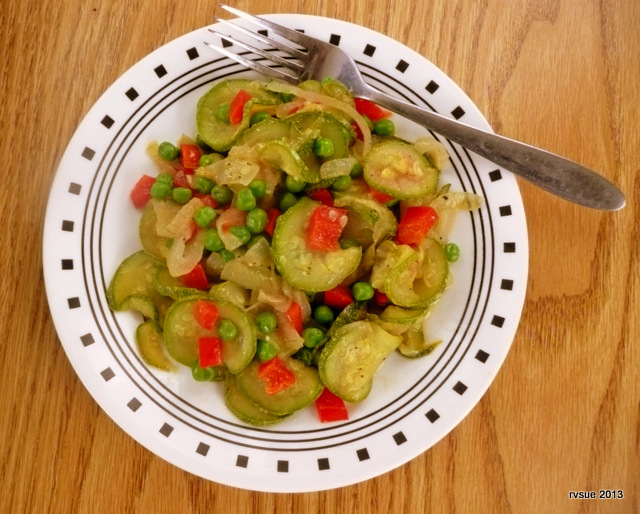 Mexican Squash Dish looks good……now if you had thrown in some copied Green Chile, it would have been even better. IMHO. No Rain out our way, plenty of Wind & Dust. 84 degree high today, down to a 61 degree high tomorrow. Cold Front reaches us. Still the wind, but maybe not so much & less dust. Here in Las Cruces, NM. Mojave rattlesnake, Mojave green,Mohave rattlesnake, Mojave diamond rattlesnake, Mojave rattler, scutulated rattlesnake. In Mexico, this species is known as Chiauhcóatl (Nahuatl), or víbora de cascabel (rattlesnake in Spanish). C. s. scutulatus has also been referred to as the northern Mojave rattlesnake. 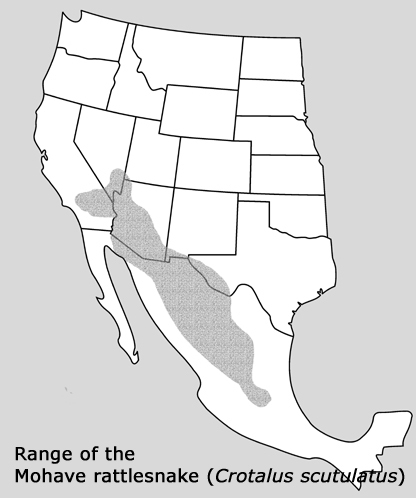 Campbell and Lamar (2004) support the English name “Mohave rattlesnake”, but do so with some reluctance because so little of the snake’s range lies within the Mojave Desert. They don’t support the spelling “Mojave”, because the name “Mohave” derives from the Native American term hamakhava. A venomous pitviper species found in the deserts of the southwestern United States and central Mexico. It is perhaps best known for its potent neurotoxic venom. Two subspecies are recognized, including the nominate subspecies described here. Found in the southwestern United States in southern California, southern Nevada, extreme southwestern Utah, most of Arizona, southern New Mexico and most of Texas. Primarily a snake of high desert or lower mountain slopes, they are often found near scrub brush such as mesquite and creosote, but may also reside in lowland areas of sparse vegetation, among cacti, Joshua tree forests, or grassy plains. They tend to avoid densely vegetated and rocky areas, preferring open arid habitats. The most common subspecies of Mohave Green rattlesnake (type A) has venom that is considered to be the most debilitating and potentially deadly of all North American snakes, although chances for survival are very good if medical attention is sought as soon as possible after a bite. Wouldn’t want to run into one for sure. Don’t believe the escaped circus snakes story will hold water. Ha! Colder weather may keep them holed up….hope so. Always one to look for a silver lining… Maybe the presence of the pawing, stomping bull keeps the snakes away? Stay safe Sue! From the snakes and the weather! Thanks, Dawn. Same to you! Thunder and lightening and pouring rain here in Michigan tonight. That rain needs to trickle down to Arizona. It’s been windy here in Las Vegas too. Everyone is having allergy problems. I bought some zuchinni last week at the store and it was $1.99 a pound. Really gripes me cause a couple of years ago when I lived in Utah, we grew so much that we couldn’t give it away!! We only had a couple of plants, but they really produce. When I had a garden in Georgia, I tried to space out the harvest times for zucchini. Even so, it would all need to be picked around the same time. I never tired of it though. Love squash! Wow, between the bull, the snakes, and the wind, sounds like you are have an “exciting” time there. The weather that Arizona experienced is heading our way, and they’re predicting thunderstorms and possible hail here tomorrow morning, with some areas getting a freeze overnight. Man, what’s up with this crazy weather? It’s April, already!! Anyway, it was interesting to read about your visit with Dixie. I know I’ve said this before, but the wonders of modern technology are amazing. People who live in different parts of the country get acquainted online, carry on conversations, and even meet up once in awhile. Stay safe, Sue. Kibbles and hugs to the crew too. Like most everything, Texas storms can be big, including the hailstones. Hope you make it through the storms unscathed. Hi Sue, Great looking dish and I like my veggies al dente too. Mushy,yuk! So, after a week late my niece finally had the baby today. Evelin was a big baby 8.15lbs and 21″ long and I say it’s about time. My plans have changed which is the prerogative of life as an Rver. Instead of heading back to Oregon for work July I will be heading to South Dakota by Mt Rushmore to work for the summer. I will be able to see all the tourist sites for free and my site will be free and I get paid. 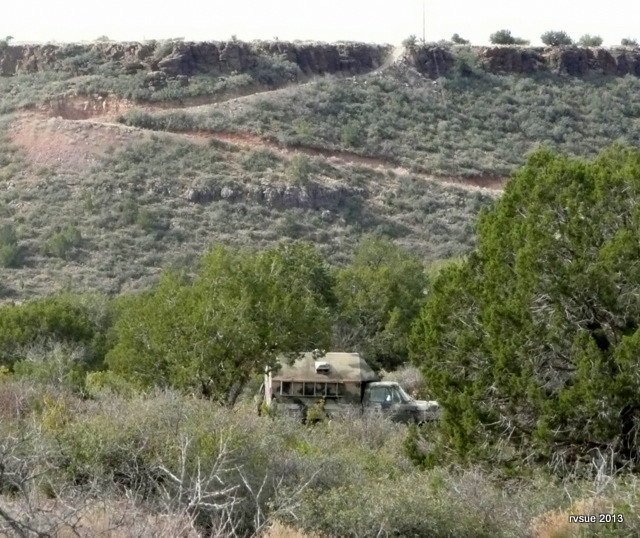 Then this fall I’m going to mosey on down toward AZ. Woot! Woot! Gotta love this life! You take it easy and have yourself a ball. Congratulations on the new baby! God bless your niece…. She did well, delivering such a big baby. Laurie, you are taking to this new lifestyle like you were destined for it! And what a fantastic place to spend the summer. I love the Black Hills. And then wintering in Arizona. You know how I feel about THAT plan! Big wheels keep on ‘rollin, Proud Laurie keep on burnin’ . .. up the highway! I love that you’re loving your life! Hey Laurie while you are in South Dakota look into getting your license plates there. RV Sue did and it is cheap. You can make SD your home base and not be bothered by that rat Uncle Sam digging into your pockets. Once FREE it is so hard to go back to being a Tax Slave, so check it out. I just may do that Rattlesnake Joe,Thanks! A South Dakota will save you State taxes because they have no Income Tax. Being a resident of South Dakota is NOT going to keep Uncle Sam out of your pockets, he wants his share and could care less where you say your home is. If the wind at the BLT was anything like it was here yesterday, I am surprise we did not end up at the boarder. Sheesh, the wind here all but had the trees lying on their sides. The cold… bitter cold, we dropped 55 degrees in about the time it takes to grill a chicken. The snow the weathermen said we would get didn’t really land here. I think we have about an 1/2 inch, if that. Kind of puts a hold on our plans to leave this week. Well, that and my husband’s trip back to the operating room tomorrow to have his “frozen shoulder” manipulated is slowing us down too. I sure hope winter ends soon, it’s starting to cut into my plans. Keep warm, and the Kibbles dry! Yes, it’s cold here, too, although our wind wasn’t as bad as yours. Sorry your travel plans are temporarily stalled. Best wishes for your husband’s quick recovery. A 55 degree drop… Crazy weather this year! Not much wind this morning, but it isn’t warming up. For the first time this winter I had the heater on for several hours yesterday and if it doesn’t warm up soon, I’m turning it on again today. Sending WARM wishes your way . . .
That dish looks really good, and pretty, too. I am not a good cook, but I make a mean squash soup (IMHO)! Saute onions and garlic in oil. Add chicken stock, season, and add sliced zucchini, summer squash, and Mexican gray squash (looks just like your Mexican squash, only a much lighter green color – I’m sure the squash you used would be great). Cook until done to your taste. It freezes well. Yummmmm! This cool weather is wonderful, even with the high winds. And, of course, we love the rain! Anything that postpones the miserable hot summers here works for me! P.S. I just got some zucchini here in Mesa, AZ for $.99 per pound. Maybe the price is going down!